Guru Rinpoche renounces his kingdom, practises yoga and meditation in the great charnel ground of Shitavana, ‘The Cool Grove’, and attains liberation. Gathering under him the matrikas and dakinis, he is known as Guru Shantarakshita. Guru Rinpoche takes the 'Rabjung' ordination from Buddha's disciple Ananda. He shows unparalleled understanding and mastery of both sutra and mantra, and is known as Guru Shakya Sengé and as Guru Loden Choksé. The king of Zahor tries to burn Guru Rinpoche alive. Guru Rinpoche transforms the fire into a lake (called Tsopema, at Rewalsar), establishes the Dharma in the land of Zahor and takes Mandarava as his consort. He is known as Guru Chimé Pemajungné, the Immortal Lotus-born. The deluded ministers of Orgyen try to burn Guru Rinpoche and Mandarava, his spiritual consort, alive. He turns the flames of the funeral pyre into a lake, from which they emerge seated on a lotus. The king, ministers and people of Oddiyana are inspired with devotion. He is known as Guru Pema Dorjé Tsal. When tirthikas from South India attempt to harm the Buddha Dharma, Guru Rinpoche, with his great power, vanquishes them along with their gods and guardians. Raising the victory banner of the Dharma, he is known as Guru Sengé Dradrok. At sunrise Guru Rinpoche is miraculously born amidst dazzling radiance in a lotus bed on Lake Danakosha. Turning the Wheel of Dharma for the dakinis, he is known as Guru Tsokyé Dorje. The tirthikas from Tamradvipa throw Guru Rinpoche into the Ganges. Rising from the water, he reverses the flow of the river and performs a vajra dance in the sky. The tirthikas are inspired with devotion, and begin to follow the Dharma. Guru Rinpoche is known as Guru Khading Tsal. The tirthikas try to poison Guru Rinpoche, who transforms their concoction into amrita nectar. Irradiant from his drink, he inspires faith amongst the tirthikas, and is known as Guru Nyima Özer. Guru Rinpoche takes the form of Vajrakumara at Yangleshö in Nepal, and subdues the local deities and negative forces. He performs the sadhana of Palchen Yangdak and attains the vidyadhara stage of Mahamudra realization. He is known as Guru Dorjé Tötreng. Guru Rinpoche arrives in central Tibet. He subdues all the hostile negative forces, founds the great monastery of Chökhor Palgyi Samyé and lights the lamp of the holy Dharma of the sutra and mantra teachings. 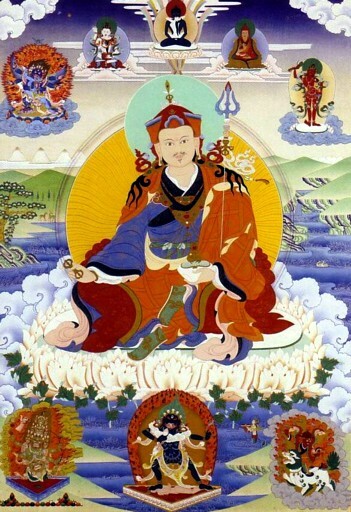 Guiding his twenty-five disciples and the king to liberation, he is known as Padmasambhava. Guru Rinpoche assumes his wrathful form in Paro Taktsang in Bhutan, and brings under his control the local deities and guardians. Making them protectors of the terma (hidden treasure) teachings, he entrusts them with secret oral instructions, to be given only to the tertöns who shall discover them. He is known as Guru Dorje Trollö. Guru Rinpoche is invited to Oddiyana by King Indrabodhi and installed as crown prince, marrying the Princess Bhasadhara. He is known as Guru Pema Gyalpo. This page was last edited on 23 May 2018, at 09:09.